Contrary to popular belief, gelato is NOT the same as ice cream but with a fancy name. Sure, both gelato and ice cream are made with milk, cream, sugar and various flavorings. But that’s where the similarity ends. One big difference between these frozen treats is that ice cream is churned by a machine, while gelato is stirred. Churning incorporates lots of air into the ice cream at a very cold temperature, which creates an icy texture. Stirring, on the other hand, allows very little air to be whipped into the gelato. This results in gelato being smoother, creamier, and much richer than ice cream. Another difference between ice cream and gelato is the amount of dairy fat in them. The milk-fat content of ice cream is generally between 15-25%. Gelato has a much lower milk-fat content of 4-9% — lower than even super-premium ice cream. 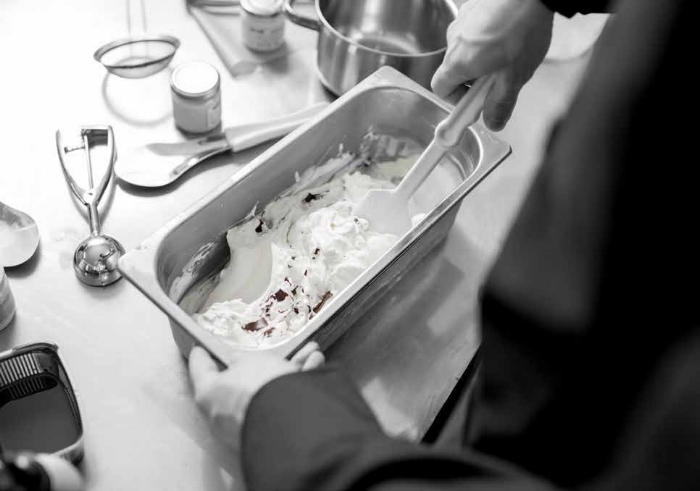 Having less milk fat coating your tongue allows the rich flavors of the gelato to surface with an explosion of taste. Both gelato and ice cream contain cream, milk and sugar (though gelato uses more milk and less cream). While egg yolks are a common ingredient in ice cream, they are generally not a part of authentic gelato recipes. Even though gelato and ice cream are both delicious frozen treats, gelato is actually served at warmer temperatures than ice cream — about 10 to 15 degrees warmer. This contributes to its soft and silky texture, and allows it to melt more quickly on your tongue. At the same time, your mouth is less numb and therefore better able to taste the finely blended flavors. Our gelato feels like a creamier, richer, gourmet treat—with LESS FAT THAN ICE CREAM!